This article is the third in our north star metric series. This series unpacks a modern approach to product management strategy and execution that accelerates product development and growth. So far, we’ve covered the definition of a product north star metric for different industries and how to organize your product team around your north star. We’ll now dive into the core games of customer engagement strategy and lay out how product managers should frame the value of their product, the goals of their user experience design, and their growth strategy around the specific game their team is playing. Defining your Customer Engagement Strategy: Which game are you playing? Every product is playing one of three games. Either you are playing to win attention, transactions or productivity. Now, I can already hear you protesting the idea that there are only three possible games. Keep reading to see if I can convince you that not only is this true, but you need to focus on mastering just one game as a product team. Without that focus on the right game, you won’t get hypergrowth. In the attention game, products are trying to maximize the amount of time your end users spend on your platform. In the attention game, products are trying to maximize the amount of time end users spend on their platform.In return, you offer the customer entertainment, information, stimulation and/or emotional relief. The easier and better you offer this value, the more time customers spend. Industries that typically play this game today are media, gaming and any one else showing you advertisements. The transaction game requires products to help customers make purchase decisions with confidence. How much time time they spend in your product is barely relevant. The transaction game requires products to help customers make purchase decisions with confidence.Endless browsing or comparison shopping might boost your vanity metrics but don’t add value to your business if you are playing the transaction game. Companies you will often find playing this game are ecommerce platforms. The productivity game requires products create an easy and reliable way to complete an existing task or workflow. The productivity game requires products create an easy and reliable way to complete an existing task or workflow.This means that product and growth teams need to optimize for rapidly getting users successful in their ability to navigate and get value. Time spent can sometimes correlate negatively to this value of efficiency. This game is predominant in B2B software but played all around us. Over the last 6 months, we have ran workshops with dozens of large digital businesses to help them refine their product management process. Often when we share this framework with product managers, their first reaction is to say that all three games are important to them. While this is true, making a clear choice about which game matters most is what strategy is all about. Strategy is what you say no to. Every product team needs to make an active choice about the game they are playing so that they can win it. Strategy is what you say no to. Every product team needs to make an active choice about the game they are playing so that they can win it. For instance, if you are an e-commerce company, and you ship features that increase the time customers spend browsing goods, it does you no good at all. In fact, it might do harm if you inadvertently decrease the number of purchases being completed. This highlights the importance of measuring performance correctly. Your model for user engagement should be perfectly aligned to your key metric, or what we call, your product north star. When your north star metric represents your customer engagement model you can improve your business success by making your product experience better. 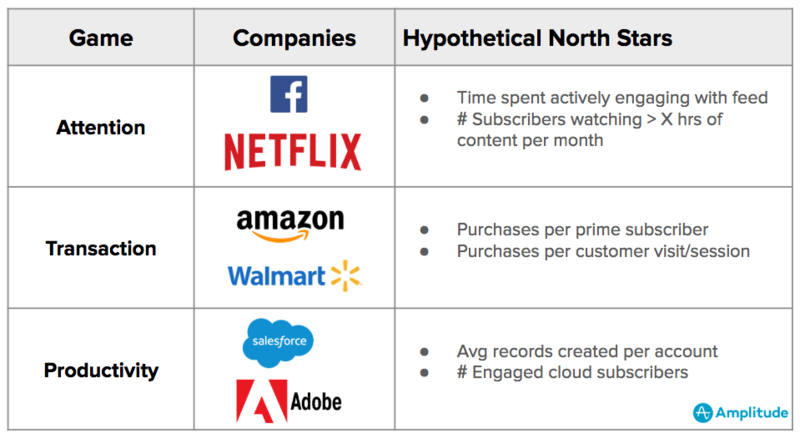 Below are some customer engagement examples of companies that are playing each of these three games and what their product north stars could be (note: these are hypothetical). You will notice that companies can play the the same game and yet have radically different north stars that reflect their unique product strategies. While Facebook and Netflix both play the engagement game, their business models are different. Facebook’s revenue is proportional to the amount of engagement a user has with the feed and hence the ad revenue generated. Netflix measures subscribers that return month after month. The north star and engagement game define much more than the KPIs a product should track. The specific engagement game you’re playing also dictates fundamental concepts around the product-user interaction and customer value exchange. Modern product management theory defines a product as a medium of value exchange between a customer and a business. Modern product management theory defines products as a medium of value exchange between a customer and a business.The product offers value—entertainment, information, utility, efficiency, mastery, status, self expression—and the customer offers compensation to the business in return. More recently, business model innovation and digital transformation have broadened the number of ways in which customers can offer this compensation. Apart from one-time or recurring payments, customers can now offer their time by engaging with ads, offer referrals, or simply by providing information about their preferences. 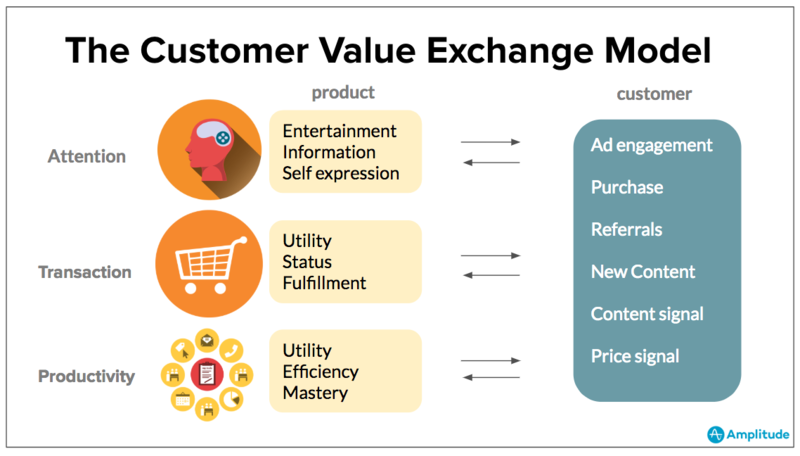 Product-customer value exchange summarized for all three of the engagement games. Entertainment, information and self expression are the three main values that an attention product can offer a customer. Good attention products paint a picture of endless content choice and use the customer engagement data to personalize user experience. Examples of these include Twitter, Reddit and IMGUR. The transaction game can offer very different types of value to a customer. Companies that offer utility are extremely focused on price points and shipping. In this excellent article on how companies should think about their market size, Eugene Wei, an early product manager at Amazon, talks about how customers care about shipping costs to an irrational extent. On the other hand, companies that offer status and fulfillment take a more curated approach in their product. To customers looking for these, the cost of the transaction matters less than the ease of making the decision. This has been the biggest driver behind luxury subscription ecommerce. Examples of these include companies like Peloton Cycle, Rent The Runway and Trunk Club. Companies that offer users productivity often focus on ease of use (utility), efficiency (saving time) or giving their customers mastery over a particular task. Today, this means being laser focused on product usability. Products playing the productivity game need to create a desire for customers to get over the adoption barrier, make their interface easy to learn and encourage users to keep investing. Examples of this include companies like Dropbox and Asana. Next, let’s talk about how to combine all three of these ideas to systematically catalyze your user growth with customer engagement cycles. 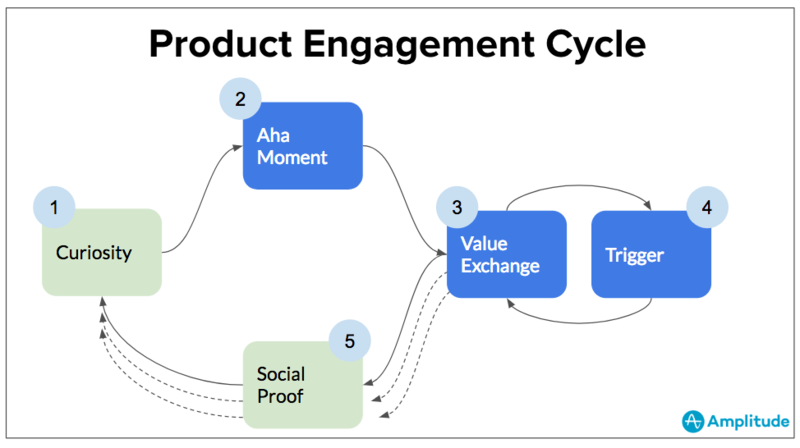 Every “engaging” product needs an interaction loop that maximizes the value created in your user’s first session and brings them back regularly. The customer engagement cycle is an interaction framework that describes the actions and triggers your customers go through when they use your product regularly. Companies that don’t have repeat use models (mortgage platforms, for instance) don’t typically need or have loops. Every “engaging” product needs an interaction loop that maximizes the value created in your user’s first session and brings them back regularly. What am I doing to drive a curious customer to their Aha moment? What’s my recurring unit of value exchange? What is the customer investing in that I can leverage to make each subsequent exchange more valuable? Am I choosing the right point in time to ask customers for reviews and referrals? New users/customers of your product enter at the point of “Curiosity”. They either see an ad, are referred by a friend or found you through search. Your product’s only job is to get them to an “Aha moment”—i.e. show them the best possible value you have to offer that drives long-term customer retention. Once they reach their Aha moment, your new users are activated. You need to now engage them in a cycle of recurring “Value Exchange”. Once they have invested sufficiently in your product, you can incentivize them to be a point of “Social Proof” and make new future customers curious about your product either through incentivized referrals or social media. Remove any possible barrier to accessing your main value proposition. Streamline your UI to make the aha-moment idiot proof. No distractions, no wandering, just the minimum steps needed for magic. Give the customer instant feedback on their actions to affirm the value exchange. Use subtle UX cues to affirm the value exchange so that the customer can clearly follow what happened and take a moment to internalize it. Create benefits for the customer to increase their investment in your product. Offer random rewards to encourage investment behavior. My favorite is Asana’s randomized “celebration creature”. Prompt for referrals, reviews etc after the customer has started investing. Timing your asks makes a huge difference not just in conversion rate for reviews and referrals but the quality of response you will get. There are many different ways to define and execute product strategy—this is just one. We have found that companies who take approaches similar to these have had great success in building engaging products. In the end, what you want as a product leader is an extreme clarity of thought and purpose in every feature and interaction in your application. No pixel should be without a single-minded purpose. Hope you found this framework useful and it helps you create a model of your product that your team can rely on to set goals, experiment with design interactions and accelerate growth! In our next article, we will dig deeper into the different engagement loops for each of the three games with examples from leading technology companies around the world.